Sometimes, words are simply not enough. Sometimes, people want something that reifies how they truly feel towards those who are going through something monumental. That is why, more often than not, they resort to something that completely evokes how they feel, something more physical and tangible, something like a card. A card, which contains a pre-written message and a written personal message from those wishing to use the medium, can be used instead of just verbally enunciating what they feel. You may also see Card Templates. This is most useful especially when someone you know is getting married and you are at a loss for ideas to give as a gift, as this particular option can be used to compensate. Cards with wedding details can be enough of a gesture to evoke to the newlyweds your sincere congratulations. Also, taking into account the very fact that there will be a lot of people drowning the couple with congratulatory messages on their wedding day, having a more tangible medium will allow the newly wedded couple to remember how you felt for them for the rest of eternity. With that said, here is a list of wedding congratulations card you can use and give out to friends or families you know are getting married. We live in a world where getting married is not (anymore) exclusive to just the binary, where those who are considered as part of the third gender mold are also being given and granted the privilege. With that in mind, this list consists of wedding congratulations card for both the cisgendered and those who are part of the LGBT community. Not only that, but this list also consists of cards in varying themes. From a Hawaiian-inspired card to vintage-themed card, there is an array of options for the different wedding themes. A congratulations card is a gesture that shows sincere good wishes and praise to people who have reached and did something monumental or great. To congratulate a couple of their love affair and the new chapter they will be embarking means that you are happy and in support of their decision. That is why a congratulations card can truly and really warm anyone’s heart. And, that is why sometimes a congratulations card is in itself more than enough. 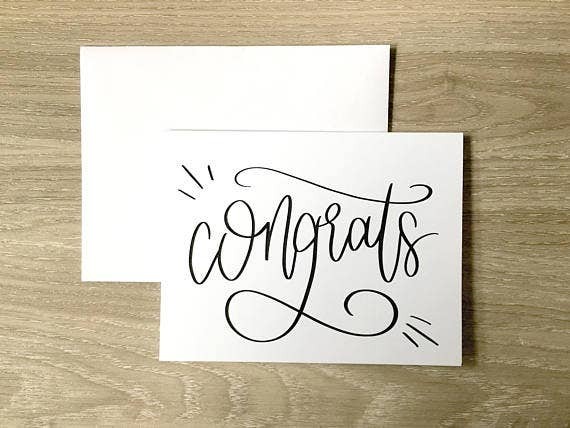 As with any medium or gesture you wish to show your sincere congratulations, going for a card comes with benefits that most do not fully (and actually) realize. These benefits help strengthen you as an individual and your relationship with the person or people you are giving it out too. You may also see congratulations greeting cards. Giving out a congratulatory card means you are proud of what they have done. 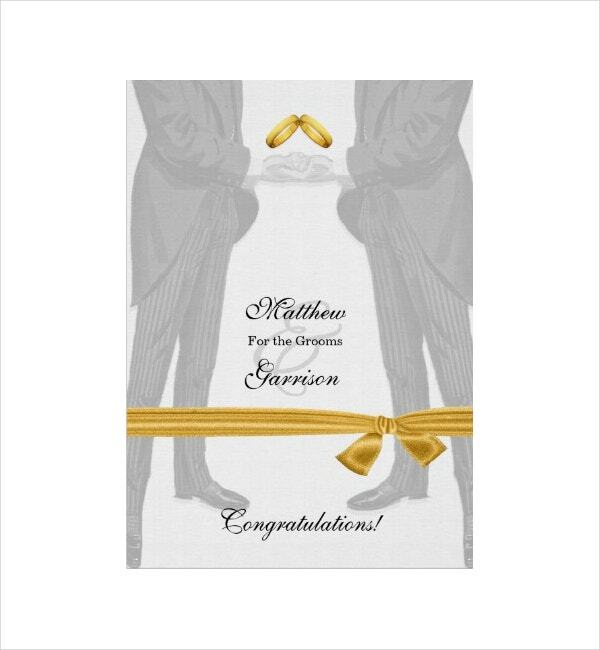 And, in this case of wedding congratulations card, you are simply evoking the idea that you are happy for the couple’s milestone. Considering that it is the ultimate goal of most people in a relationship, seeing them achieve such can only make you really happy for them. You may also see sample greeting cards. 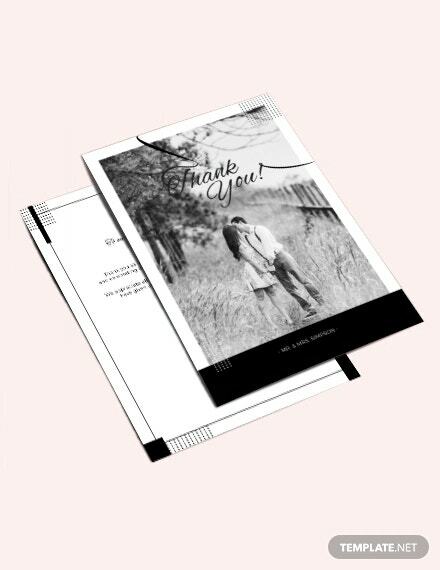 And with such gesture— of giving them a congratulations wedding card —can only fill their hearts with so much joy, knowing that the people around them, including you, is also very happy for them. 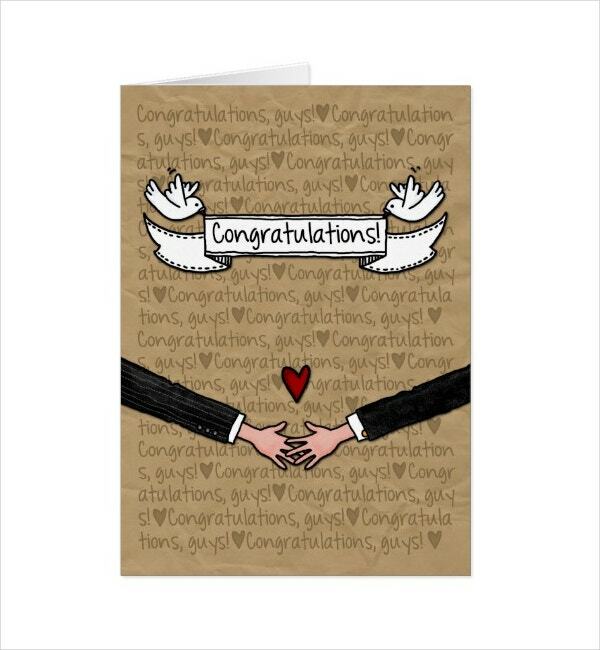 Congratulations wedding cards can act in itself as a wedding present. When you are at a loss for gift ideas to give a couple or is under restrictive budget, this card can be used to compensate the lack thereof. 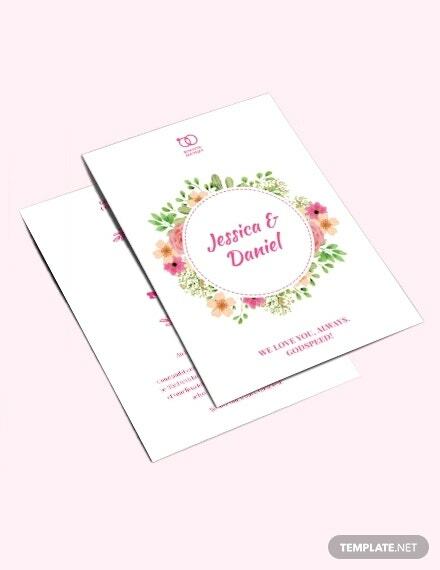 A wedding congratulations card can effectively work with a meaningful and sincere congratulations and a personal message to go with the prewritten congratulatory message. You may also see graduation congratulations card designs. You can also include a cash to go with your card or even a gift certificate, or voucher, or anything that can be easily inserted into it. Congratulations cards are really an affordable option as a gift but are able to speak to the couple receiving in so many ways. It will also allow them to feel loved and special, especially with a handwritten letter or a poem to go with the congratulations just for them. When you find expressing your emotions or yourself to others a struggle, a card can be used as an aid to that. You can just simply write down what you feel or think about the couple (how you met them both, your first impression of them together, basically the entire narrative of their life as a couple and what you think of it). You may also see printable wedding cards. When you take the time to write down what you feel, it will translate to the couple reading your message. There is the inevitability of them seeing your sincere gesture and effort or your sincerity in general. You may also see wedding card examples. 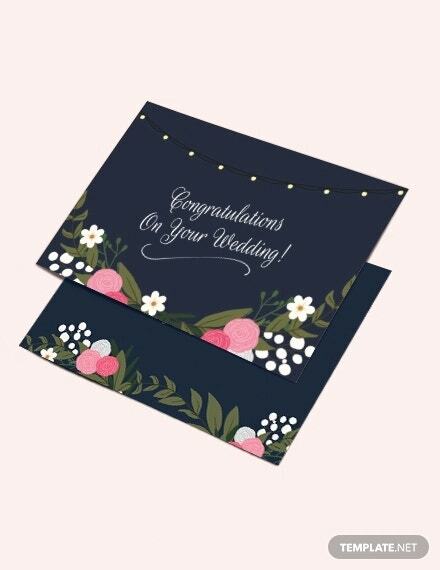 What should go on a wedding congratulations card? Considering that this card is premade, meaning you have the task to finish and finalize the end result or generally, how it will look like. There are certain pieces of information you want to include in your card to make it more personal and unique. Although each card is different from one to the other, there are different pieces of information that they all most commonly share. You may also see wedding card designs. Depending on the design you will be choosing, it is important to have a photo that is related or relevant to a wedding (some are already provided, others you can simply add). By simply doing this will right away give the idea that the card is for a wedding event or for a couple getting married. You have to beautifully or strategically place the photo(s), that will leave ample space for you to write down your own message. Commonly, photos are placed on the front or the cover page allowing the rest of the page to be free. You may also see sample wedding cards. It is common for cards to already have a prewritten message on it. 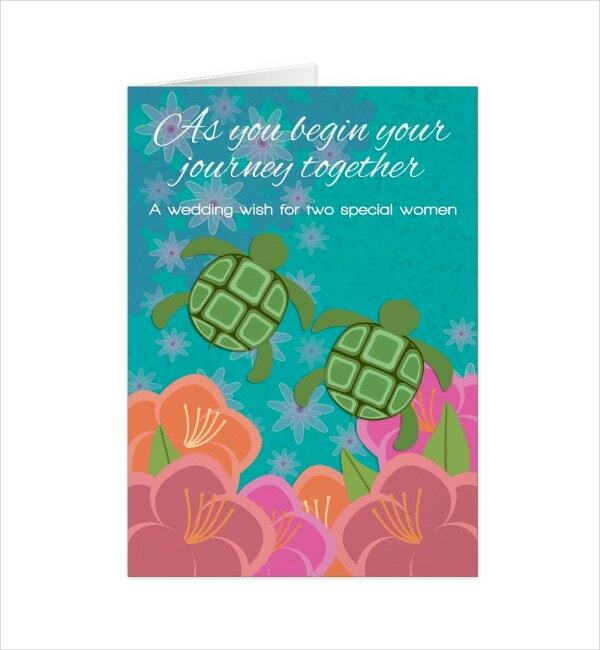 It mostly varies from one card to another, but it evokes the same idea and message— to congratulate the couple. It can be a simple “Congratulations Mr and Mrs” or something more elaborate like “Hurrah! Congratulations! May your married life be filled with fun, love, joy, and laughter!”, or it can also be something witty or funny to give the couple a little laugh. You may also see handmade greeting card designs. 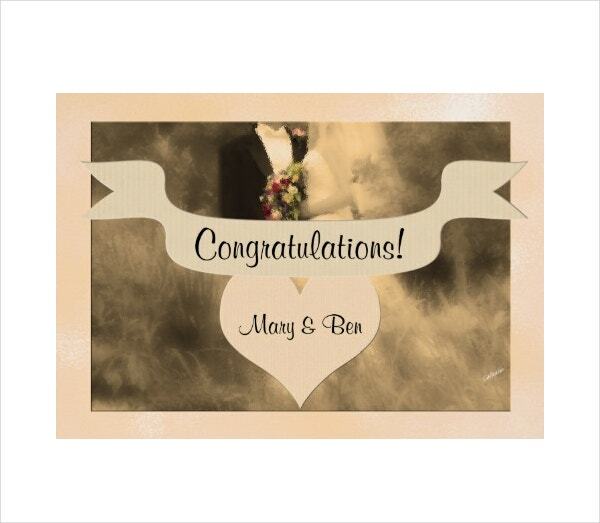 Having the name of the couple on the congratulations card will simply make the card more personal and meaningful. Names do that, so to have it on the card makes everything more personal and unique to them and only them. It also makes the receiver feel special and loved knowing that the card is specially made and written for them. You may also see creative wedding invitation cards. With the ample space you are provided, you are given the liberty to write down your very own personal message for the couple. You can also do that on a different piece of paper and simply insert it or directly write in the space allotted for it. Personal messages can vary from one sender to another, some write in a funny voice, others in a more serious and meaningful tone. It solely depends on how you wish to write it, but the idea is all similar across the different personal messages. You may also see blank wedding cards. With this on the card, it will also make the couple feel more special and loved, knowing that you took the time to actually write down how you feel for them. It is an effort and gesture that speaks a thousand words and with a thousand more, they will ultimately feel the happiest and inevitably feel the most special. You may also see wedding card templates. How to best acquire your very own wedding congratulations card? 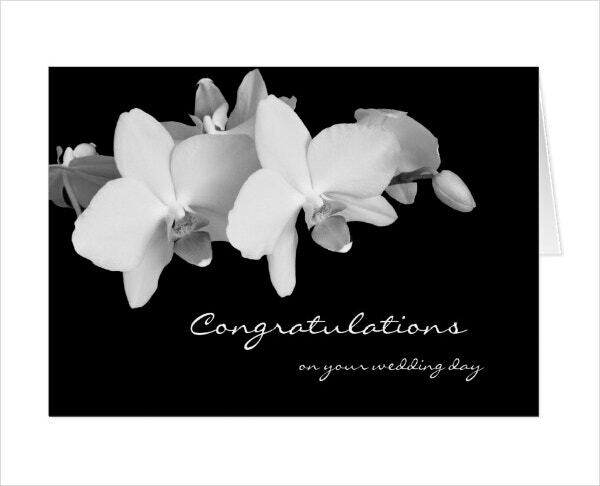 There are countless ways to get your very own wedding congratulations card. Depending on what your preference is or where your simple budget can take you, you have as much option as you wish there is. You can either have one custom made by a professional graphics artists or you can just simply buy one that is premade and readily available online. The two are actually equally capable of giving you the wedding congratulations card you need, but one of the two is a much better option because of the advantages it entails. To begin, the first option which is by seeking the help of a professional graphics artist cost more than the pre-made option. And, this is because going for the custom-made option comes with certain factors that are being taken into account that leads the price to skyrocket. You may also see elegant wedding invitation templates. As such are the consultations that take place before creating your congratulations card, so the graphics artist will get a clearer idea of what you want and desire as a client. Then, there are also the numbers of hours the graphics artist will spend in creating your card to meet your demands and requests and to make it as perfect as possible. You may also see funny wedding invitations. However, going for a premade option costs a lot less and this is because all the designs that are premade are made by the designers in assumption to what the customers might want. Meaning, they are not under the obligation to follow any demands, requests, timetable or sample schedule; they do everything according to their own preference, at their own time, and at their own pace. Also, with choosing to go premade, you are also given an ample freedom to do whatever you want in terms of design as the texts, colors, sizes, and even few of the other elements are fully editable and customizable. Sometimes, they come with smart object layers that allow you to move around elements to create a more personalized wedding congratulations card. The premade option also comes in different designs and theme perfect for any kind of wedding. 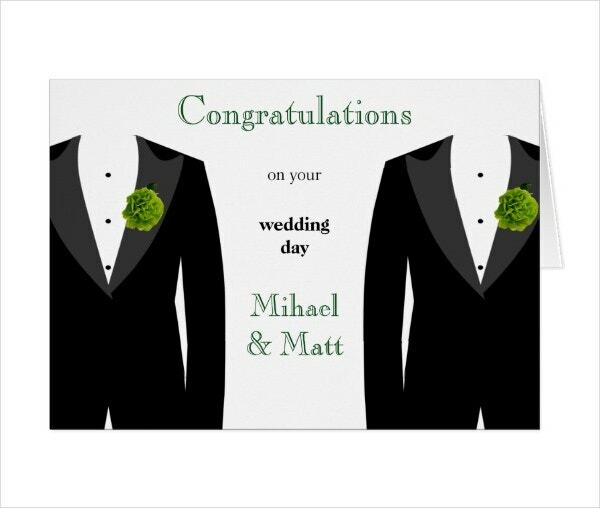 There are floral designs, there are simple designs for the more classic and traditional; there are also gay wedding congratulations cards for those in the third gender mold. Ultimately, this makes the premade option a much better and ideal choice as it is both diverse, practical and efficient; affordable, but does not compromise the quality of design, and is really doable. If you found this article helpful in any way, do not forget to bookmark this page for future references. And, kindly share this with other person or individual seeking the best wedding congratulations card to give out. You may also see modern wedding invitation.